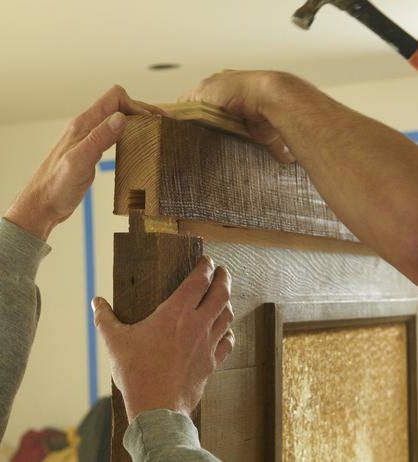 There’s something rewarding about building your own doors – especially if they’re doors for your home. In this how-to, our door installation experts give you the basic instructions for building your own door. All you need is a few materials and some patience. After that, use your miter saw to cut two stiles the height of the door. In the center of one side your stile, use your miter saw to carve a groove that’s 1/4″ wide and 3/8″ deep. Repeat step 3 for the other stile. Next, cut three rails. Each rail should be the width of the door minus two times the stile width. You’ll also want each of your rails to have two 3/8″ tenons (one on each side in order to fit into the grooves in your stiles. Create the same grooves (1/4″ wide, 3/8″ deep) in your rails as you did in your stiles. Now that you have your stiles and rails completed, you’ll want to create your final door panels to fit into the middle. Cut the width of your panels to be the same width of your rails minus 1/16″. After that, slide the panel into the grooves in your rails to make sure it’s the correct width. Then, you can slide the stiles onto your panel to determine the right length. Once you’ve determined the length, cut your panel to fit into both your rails and stiles. If everything fits correctly, use your wood glue to fit all of the pieces together and use clamps to hold the joints together tightly. Once everything is dried, you can sand down your door and paint it or stain it. After that, affix the proper hardware and hang it!